The Angelic Realm Drops ® jewelry was introduced during the most talked about time in recent history, November 11, 2011 or 11/11/11. They are also a reminder of one of the most important significance of time 11:11 (am & pm) and its availability as a Gateway to higher consciousness, a moment in time where the Angels of Light can take your offerings, prayers and good intentions to assist their manifestation on the Earth. Whenever the 11:11 presents itself, it acts as a daily reminder to take that one minute to hold your dreams in your heart, acknowledge the support available from the Angelic Realm, and having the courage to affirm your willingness to move into new dimensions of Love. These crystal come in a 1.5 inch glass vial with silver cap to help maintain their vibration and limits the amount of air exposure along with a silver plated chain. A gift to the world by one of Andrew’s greatest Shaman/teachers Dr. Andres Encana, these are a collection of crystal chips from some of the most sacred places on earth. Dr. Encana formulated a collection or “gathering” of sacred crystals to be used as “tools for transition” , designed to help those become closer to their healing angel in order to ready themselves for the transition to a more spiritual awakening. The crystals have been hand picked and placed into a glass vial and sealed to ensure its powerful vibration remains intact. Uriel: These exceptional red ruby, feldspar and jasper gems stimulate the Root Chakra and red healing rays, harmonizing fidelity with family, stimulating understanding and moving your beliefs to a place of security. These angelic stones evoke the substance of earth and the fiery cosmic breath of our life force. Aspires to ruby and the life lessons of passion and spiritual devotion. Gabriel: These stones of carnelian, danburite, and orange calcite, emulate happiness, bring vitality, abundance and longevity. It offers protection and resonates with the Navel/Spleen Chakra. Energizes and empowers one’s self. Warms the heart and lifts/rejuvenates the spirit. These angelic stones protect against “energy vampires”. Aspires to carnelian and the life lessons of guidance and awakening. Jophiel: These stones of citrine and sunstone stimulate personal power and are excellent crystals for working on the Solar Plexus Chakra. It enhancing our senses and feeling of security allowing us to establish our “boundaries”. It lends a calming and peaceful air to the area in which it is placed. It balances mood swings and making us more aware of our own emotions, promoting inner peace. Aspires to citrine and the life lessons of energy and renewal. Raphael: this powerful, heart healing stone called peridot or olivine is one of the best healers. Stimulates the Heart Chakra it promoting compassion, discerns the ego body, and is soothing for mental health. This crystal enlightens meditation and helps soothes stress, anger, anxiety, jealousy, depression and emotional blockage. Aspires to peridot and the life lessons of healing and harmony. Chamuel: embraces rose quartz, the most quintessential love crystal on the planet. Stimulating the Heart Chakra, it helps with self-acceptance. Allows us to realize that all change is important, even difficult change. Stimulates love, beauty and tender appreciation of all things. Aspires to rose quartz and the life lessons of love, relationships and growth within them. Michael: this impeccable lapis lazuli crystal incorporates and encourages inner self-knowledge, embraces self-awareness and will show you inner truth, when you really choose to look. 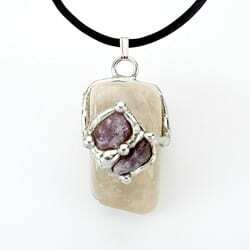 This stone relates to the Throat Chakra encouraging communication from the heart. Incredible for calming guilt and aggression. Aspires to lapis and the life lessons of truth, wisdom and protection. Raziel: this infamous iolite crystal, has a high spiritual vibration. It is a naturally occurring tranquilizer that is extremely powerful in transmuting energy into the greatest good. This stone is used for unlocking Universal mysteries and is associated with the Third Eye Chakra. A crystal that provides common sense and flexibility in decisions. Aspires to iolite and the life lessons of focus and intuition. Zadkiel: this balancing amethyst crystal is a perfect duo of healing and detoxing.It is a stone of transformation and spirituality. 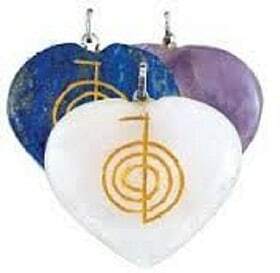 It stimulates the Crown Chakra providing an atmosphere for moving on to the next level. Use this stone to learn how to let go, trust and surrender. 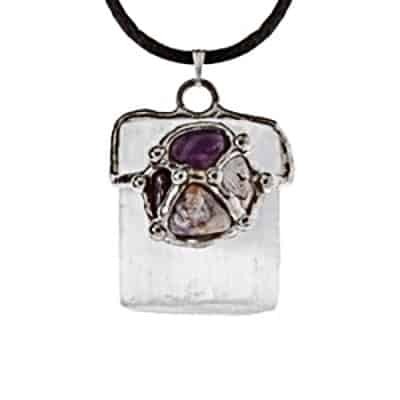 Aspires to amethyst and the life lessons of change and transformation. 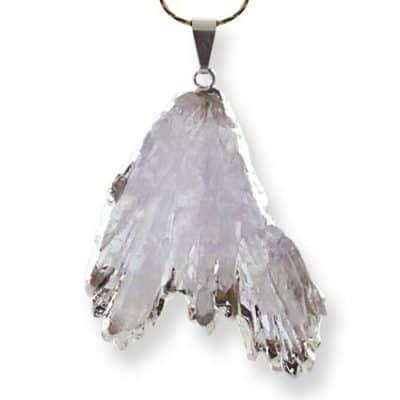 Metatron: this herkimer diamond, quartz and danburite combination are brilliant light stones used to represent Metatron the Overseer of all the Archangels, Metatron’s name means “thrown sharer (one who guards)”. This angel writes down the good deeds people do on Earth, as well as what happens in heaven, in the Book of Life (also known as the Akashic Record). Aspires to herkimer diamond and the life lessons of ascension and activation. Queen of the Angels: this blend of seven rainbow colored crystals designed to protect and repair the constant bombardment our energy field takes on a daily basis. From pollution, electromagnetic fields, negative energy and personal attacks, this powerful mix of sacred rainbow stones vibrates at the highest frequency for the utmost care and repair. Aspires to the Chakra rainbow and Mary, Queen of Angels. The Angelic Realm Drops ® jewelry was introduced during the most talked about time in recent history, November 11, 2011 or 11/11/11. They are also a reminder of one of the most important significance of time 11:11 (am & pm) and its availability as a Gateway to higher consciousness, a moment in time where the Angels of Light can take your offerings, prayers and good intentions to assist their manifestation on the Earth. Whenever the 11:11 presents itself, it acts as a daily reminder to take that one minute to hold your dreams in your heart, acknowledge the support available from the Angelic Realm, and having the courage to affirm your willingness to move into new dimensions of Love. 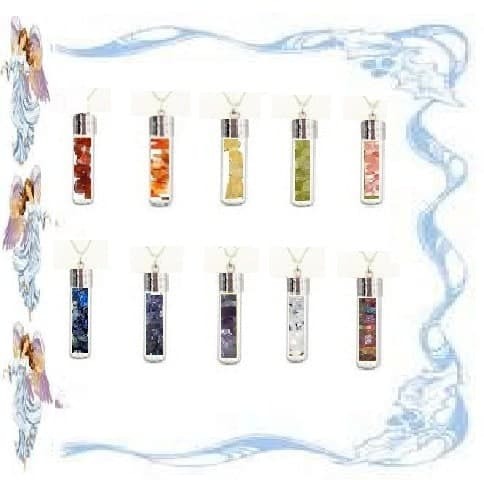 These crystal come in a 1.5 inch glass vial with silver cap to help maintain their vibration and limits the amount of air exposure along with a silver plated chain.